​Annemieke Harmonie (Bachelor of Education, Dip of Teaching, Dip of Shiatsu) was born and raised in Holland. She has learnt the harp since she was nine. From a young age she was asked to perform for people in rest homes, churches, in restaurants, schools etc. ​Annemieke started a harp school in Auckland in 1995, and they traveled with 15 harpists to Great Barrier Island and Waiheke Island for local performances. ​Annemieke met Sue Johnson and together they made a CD with original songs, featuring voice, harp and guitar. They entertained their music in restaurants, at parties and at weddings. 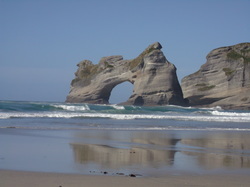 In 1999 Annemieke moved to Dunedin, and during the next 12 years she had three children and ran the Dunedin harp school and orchestra. 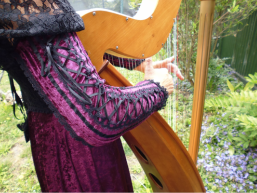 Annemieke introduced the harp to schools with an interactive show. (This show is available now too for schools or other groups.) Please contact for details. In 2010 Annemieke and her three children moved to Nelson, after traveling through New Zealand to find a good place to live and a bit warmer then Dunedin...they enjoy growing their own organic food. Her book 'From My Life to Yours' was published in November 2018 and now available online and as a paperback world wide.